Lands End is a quaint 2 bedroom 1 bath cottage at the edge of Lake Ontario in the heart of Wellington. Perfect for romantic getaways, professional retreats or family vacations. 1 short block to the Drake Devonshire. 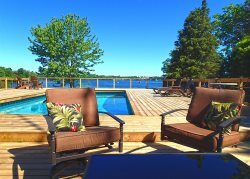 Steps away from three other Sandbanks Vacations & Tours favourites --Wellington Lake House, Corner Haven and 21 East -- rent all four homes for your extended family gatherings. Sleeps 4 in beds and 1 on single foldout bed. With stunning water views from the dining room, living room, master bedroom and deck, this cottage is the perfect place to unwind and get away from it all. Cook up a storm in the kitchen opening onto the dining room. Seats 6 overlooking the water. The kitchen is equipped with fridge, stove, oven, kettle, toaster, cookware, cutlery, and dishes. There is no dishwasher at this property. Relax in the spacious living area with plenty of comfy seating: either in the nook with a front row seat to the beauty of Lake Ontario or on chilly Fall nights in front of the gas fireplace. The nook opens onto the deck at water’s edge. Upstairs find two bedrooms, one with a King bed and a fold out single bed, and one with a Double. There is also a cozy loft area with Cable TV and DVD player on this level. Bed and bath linens are supplied. Please bring beach towels. A newly renovated 4-piece washroom is found on the main level off the kitchen and HE washer in kitchen closet with dryer in the room off entrance. Wireless internet enables you to stay connected during your stay. Other amenities include Smart TV with Netflix, TV upstairs with over 50 DVDs, Stereo, Iron & Ironing Board and Books/Games. Lands End is steps away from The Drake Devonshire, East and Main Bistro, Pomodoro, Foodland IGA and a short walk to the Wellington beach. There is street parking available beside the house, or alternatively parking on Main Street. Use the parking pass provided at the property and put it face up on the dash of your car. PLEASE NOTE: There is no water access from this property. The closest water access is a short walk away at Wellington Beach. Children age 6 and up are welcome due to the steep drop off outside of the property. Children will need to be watched when outdoors as there is no fenced back yard. Available Spring, Summer and Fall. Available for WEEKLY RENTALS ONLY from late June to early September. Short stays available Spring and Fall. 2 night minimum. This is a quaint little waterfront cottage! The location was amazing for wine touring and general meandering in Prince Edward County. Galen was very attentive to our needs and it was a great stay! Thanks so much!! Amazingly cozy spot right on the water, with unbeatable views, and a block away from all of the best local spots in Wellington. Highly recommend! Awesome spot for a girls weekend and to celebrate a birthday. The views were gorgeous and the location was perfect. Thanks so much!! This house has the best location and the most wonderful view of any Airbnb we have stayed in. Great hospitality. Great view of the lake and close access to shops, restaurants and millennium trail. I have had the opportunity to stay at many different locations in PEC over the last 30 years. But I have to say, that Lands End is one of the best spots I have stayed in a very long time. I will be back for sure. Thanks so much! The place was really great for a weekend in the area! Excellent location to walk to all the restaurants in Wellington and the view was spectacular! Would definitely recommend a stay here. We all thoroughly enjoyed staying here in this beautiful house! The location is superb and waking up to the sound of the lake was bliss. A very comfortable stay and we will be sure to come back again. Thank you! Fantastic lakeside cottage. Perfect weather to enjoy the sights and surroundings. An absolutely fabulous week! So relaxing - a beautiful spot, yet so close to restaurants, shopping etc! Beautiful way to celebrate 2 birthdays for the hubbies as well as fathers day. Lovely spot to sit and enjoy the view - no electronics needed. We are frequent County visitors as my hubby is a local. We will be back. Stunning property! Galen was excellent with the check-in. Thank you for a wonderful weekend! We'll be back! This was the perfect spot to retreat for our mother - daughters girls weekend. The perfect place to disconnect and recharge. We enjoyed drinks and laughs on the deck, walks up and down main street and a delicious beer at Midtown Brewing Co. Having a cottage like setting but being close to amenities was great. Would love to bring family and friends back to this beautiful little spot. Thank you! Thank you for another amazing anniversary get away! 17 years this time. We love this spot, the water, the shopping and beautiful scenery. This cottage always has everything we need to recharge! This spot is so central if you are visiting PEC and not far from the wineries! What a beautiful lake view to wake up to in the morning/beautiful sunsets to watch at night. Loved being right on the water! Beds were very comfortable and the place is very clean. Amenities were great! Will definitely visit again. October is such a crazy busy month for us. 3 kids, birthdays, parties, Thanksgiving, anniversary. We wanted to book a nice relaxing weekend away to recuperate from such a chaotic stretch. Wow, did Land's End ever deliver! What a perfect place for us to relax and enjoy our 16th Anniversary. Thanks you so much for the great weekend away. We will most definitely be back. Wonderful place to spend the week of our wedding. Attention to cleanliness and comfort was much appreciated. Great area with beautiful beaches, wineries, and local shops. Thank you for making this wonderful cottage available; it was simply a joy. This was another of many great vacations in your cottages. Your attention to comfort, detail and cleanliness is much appreciated. Glorious weather, incomparable views, cozy cottage - what more could a person ask for? Thank you for sharing all the best that the county has to offer. We will definitely be back next summer if not sooner! There is street parking available beside the house facing the water, or alternatively parking on Main Street. Use the parking pass provided at the property and put it face up on the dash of your car. Please refrain from blocking the neighbours driveway over the grass in front of the wood shed. Children age 6 and up are welcome due to the steep drop off outside of the property. PLEASE NOTE: There is no water access from this property. The closest water access is a short walk further east at Wellington Beach. Sandbanks beaches are 20 minutes by car as are the beaches at North Beach. One block from Drake-Devonshire Inn, East & Main Bistro, Pomodoro and other eateries.